From left to right: Nick Goldstein, vice president of regulatory affairs, ARTBA, Karen Harbert, president & CEO, U.S. Chamber’s Institute for 21st Century Energy, Janet Kavinoky, executive director, U.S. Chamber’s Transportation and Infrastructure, and Ron Anderson, managing director, public and government affairs, AAA Mid-Atlantic. New federal standards for ozone under consideration by the U.S. Environmental Protection Agency (EPA) would undermine significant progress on project delivery for transportation projects, ARTBA Vice President for Regulatory Affairs, Nick Goldstein explained to an audience July 21 at the U.S. Chamber of Commerce. 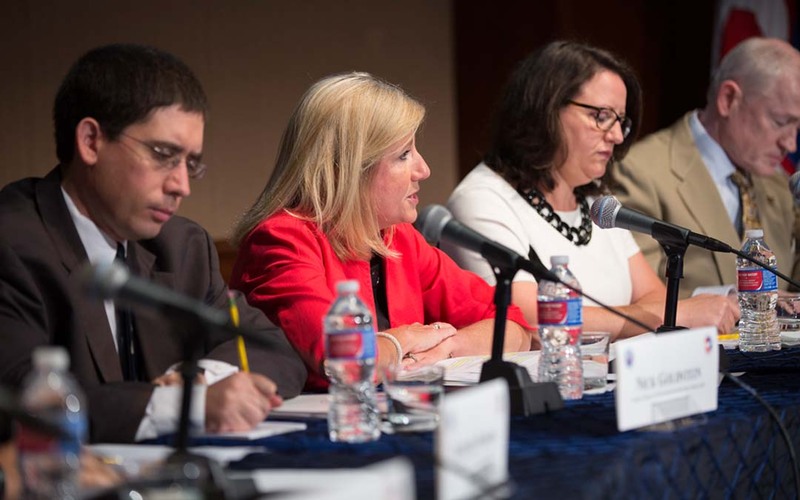 Goldstein appeared as part of a panel consisting of both local and national transportation advocates reacting to a recently released U.S. Chamber report entitled “Grinding to a Halt,” which details the impacts EPA’s new ozone standards would have on the Washington, D.C. region. Goldstein noted even though both parties in Congress have identified reducing transportation project delivery time as a goal, EPA’s proposal could potentially halt projects in hundreds of counties that would not meet the new standards. Goldstein also argued there is no need to tighten federal ozone standards because current standards are working, and cited numerous federal actions that are already reducing ozone levels. Read ARTBA’s March comments to the EPA on the proposed standards.